Welcome, Vs. System 2PCG fans, to our second preview for the first Issue in the newest Arc; Great Power! 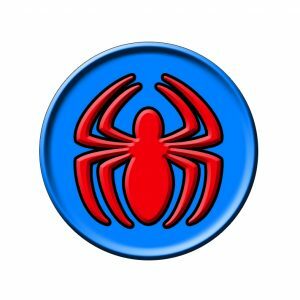 Today we are going to continue exploring the new Spider-Friends ( ) team with another Spider-Man, sort of. 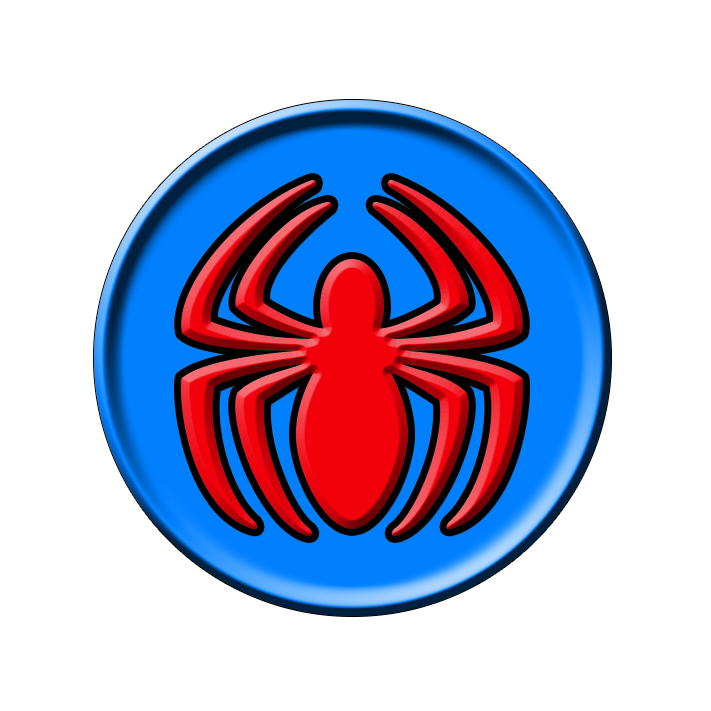 As you may know, Scarlet Spider was created as a clone from Peter Parker’s DNA. And because of this, there was a lot of confusion about who was actually Spider-Man, who was actually Peter Parker and the like. So in the game, Scarlet Spider starts as a different “Spider” hero until his true self is revealed once he reaches Level 2. Note that at the start of the game, when each player reveals their Level 1 main character, you’ll reveal Scarlet Spider. Then, you’ll put a character from your Spider Web on your side as your starting main character after you see your opponent’s main character (you don’t have to decide who you’ll start with before this moment). Your Spider Web is a new pile you use when you choose Scarlet Spider as your main character. It’s very simple: it consists of 1 copy of each other Level 1 main character with “Spider” in their name. 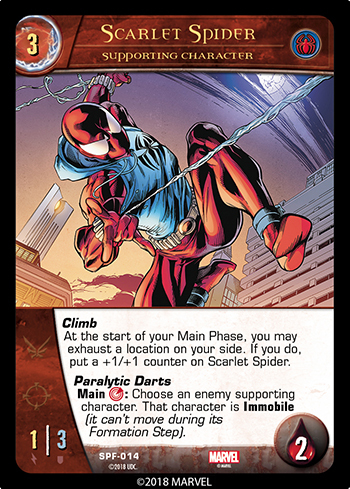 As of this writing, this consists of Spider-Man from The Marvel Battles, *Spider-Man* from the Monsters Unleashed expansion, and Spider-Man and Spider-Woman from this set (spoiler). So for example, if you chose The Marvel Battles Spider-Man to be your Level 1 main character, when he would become Level 2, he instead transforms into Scarlet Spider Level 2 (he keeps his counters and orientations just as if he leveled up from his own Level 1). Surprise, it was actually a clone all along! 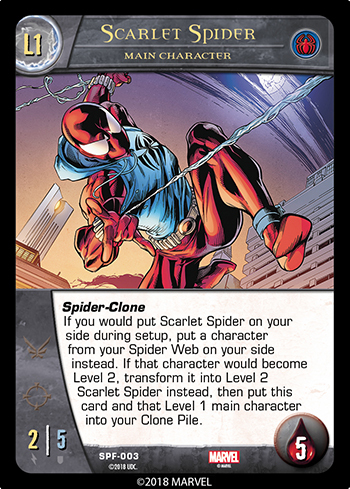 And when Scarlet Spider Level 2 appears, you put Scarlet Spider Level 1 and whichever Level 1 you started the game with (in our example, the Level 1 The Marvel Battles Spider-Man) into your Clone Pile (they’ll be the only two cards there for now). But what’s a Clone Pile, you might ask? Just because the real Scarlet Spider has been revealed doesn’t mean he’s easy to take down. When he would be wounded, you’ll reveal a random card from your Clone Pile to see if it was really the Scarlet Spider or some other clone. If it was a clone it goes back to your Spider Web. 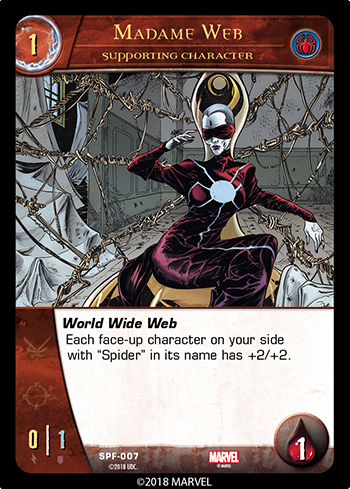 But don’t worry you can keep moving cards from your Spider Web to your Clone Pile to keep ‘em guessing! Now maybe it’s clearer what exactly is going on! Maybe! 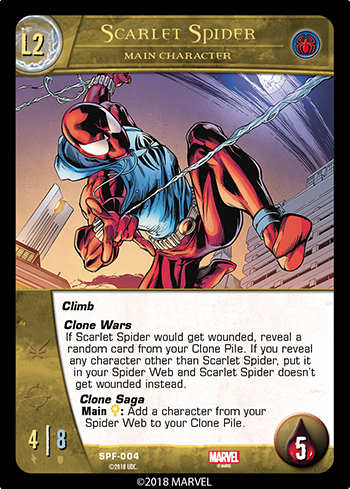 Scarlet Spider takes advantage of the clone-fusion to deceive his enemies into errant attacks. He’s a slippery, scarlet customer! Please note a couple of things about Paralytic Darts: the darted character can move in other ways, just not in their Formation Step, and Immobile will last on the darted character until that character leaves play (not just for its next turn). You may have noticed a slight “spider” theme in the first few cards we’ve shown off for this Issue. It’s been subtle, and our next and last card is no different. What can we say, we’re arachnophiles! Tune in next time when we take you around the friendly familial neighborhood!